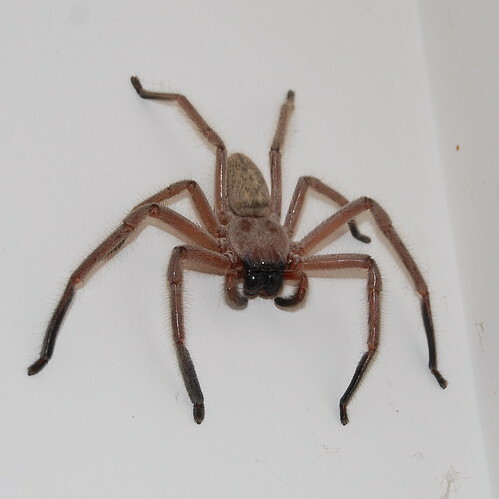 I grew up in Tasmania and spiders were a common thing where we lived. We had lots of trees which huntsmen spiders in particular loved. I do not remember seeing a redback, white tail, funnel web or other highly poisonous spider until we moved to the 'mainland'. As a child here is what my dad did to help me get over my fear of spiders. One day, he was holding a small, non poisonous black spider. He showed me. Asked me if I would like a hold. He convinced me it was harmless and despite me saying no, put it on me. (I would like to point out, I was not screaming or really terrified and had I been, I am sure he would not have done it, so no like child abuse or anything, don't worry). So it crawled on my arm, which felt funny, but yeah, was no biggie. We did it a few more times and I was no longer scared. In fact I developed quite a keen interest in spiders, borrowed books from the library, studied what spiders there were, vowed never to live in Sydney as they have the wonderful funnel web and other such lovely spiders I had no intention of ever seeing. It was 1992 and I was 7. Fast forward a few years and my sisters and I left our house to walk to school. Our house was on the diagonally opposite block to the school, one house down. So we walked across the road and were pretty much there. This particular day we crossed the road and a lady screeched to a halt in front of our house and jumped out screaming. We asked what was wrong. She had moved the mirror in her car and a huntsmen dropped out. So I crossed the road and got in her car to pick it up. Yes, with my bare hands. I was either 10 or 11 at the time. Meanwhile mum had raced out of the house having heard the tyres screech and a hysterical woman she thought one of us had been hit. Instead she sees one daughter on one side of the road and another inside this freaking out womans car. Once mum found out what was going on she did not come any closer. She was terrified of spiders. I got the spider out, the lady was grateful, mum went inside and I went to school. Yes, my teacher loved me. I took it right into class to show her what I caught on the way to school. "Look miss" I open my hands. She of course jumps back and tells me to take it outside. It was not the first nor the last time I picked out a huntsman. They are pretty harmless. I'm not insane though. I won't pick up bad spiders like redbacks and things. I just kill them. One time I did catch a funnel web. I was about to go swimming, right after we had moved to Sydney. I am about to jump in the pool and what do I see? A freakin funnel web! WHAT? Damn you Sydney, I never should have moved here. In case you didn't know, they can still survive in water for hours. Air gets trapped in the hair on their legs or something, so there is no point trying to drown most spiders. We (my best friend and I) were living way out on a sort of farm on Sydneys far outskirts. I called out to her to get me a bottle or jar or something and a piece of paper or card since she was in the house. Meanwhile I scooped it out of the pool with the leaf scooper thing and dumped it on the ground. I'll be honest. I was scared. I had no shoes, just my swimmers on and this thingscould probably run at me fast if it wanted. It was about 2 inches long as well. Gross. Bec comes down towards the pool, "What do you need it for?" When I tell her and point to the spider the bottle promptly gets thrown at me, she screams and jumps back. The funnel web is in a ready to pounce position but I am still not sure it is even alive. I had shaken the pool thingy when I scooped it out and it did not move. I had poked it with the pool thingy and it had not moved. I decided it's dead. So I moved in closer, lay the bottle near it and get the paper ready to help slide it into the bottle. Just as I was doing this, it moved. It was totally dead. I slipped it in the jar and took it inside with a lid on. The whole time it stayed in the attack position. I kept it to show the others we lived with as there were kids there and I wanted them to look out. It was a good sized female too. Basically if you want to overcome your fear, learn about which ones can actually hurt you or are aggressive so you will know what to do. Most spiders will leave you alone. Ones like daddy long legs are actually good to keep around, as they keep redbacks away. Just like a red belly black snake is fine to leave around as it keeps away brown snakes who are vicious and aggressive. In case you are wondering, yes. In the same house as I found the funnel web, a red belly black snake lived under our porch. It was more scared of us and would slither away as we approached. Yes they are poisonous, BUT, since it had come, there was no longer the brown snake issue, which is much, much worse. They will attack you for no reason. At this point my daughters have no fear of spiders. They do not touch them and I want to teach them so as they grow they will not be afraid of them. I am ok with snakes and spiders, but cockroaches make me want to scream and vomit at the same time. They make my skin crawl and I cannot stand them. Same goes for rats and mice. Irrational, I know and I am learning to get over it, but I did not have exposure to them when I was young, so they are just DISGUSTING! See, I can catch mice and rats with my bare hands... surprised u didn't mention the time when you lived around the corner, let a huge spider in my house and REFUSED to come get it out again. I have been that "freaking out woman" but had to leave the car and walk to get help. Not good. Any other spider and I am fine. Huntsmen, no way. lol, I thought you might remember it Rachael. And Jac I do remember it not working for you. I also had eery right to refuse. I had 2 young kids and would have had to walk 500metres to your house! In the COLD.